James J. Holten (BS '64) remembers the days when SIUE's campus was located in East St. Louis. He was one of SIUE's first graduates after the campus relocated to Edwardsville. Holten still revels at what the University has accomplished over the last 50 years. "It is amazing to see how much the campus has expanded," he says. 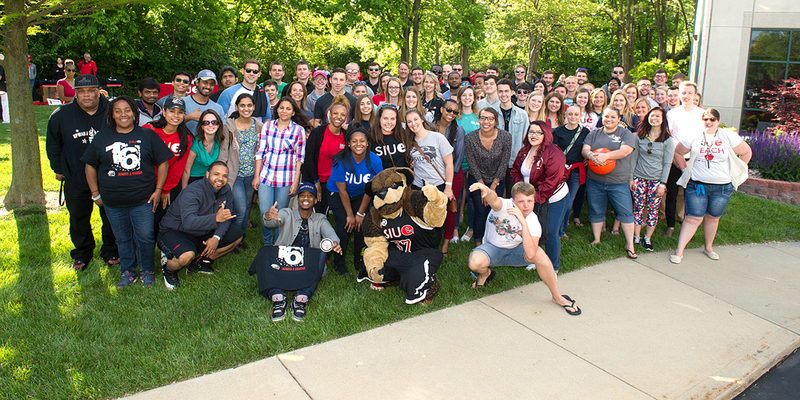 "SIUE has earned great respect in so many fields and in such a short amount of time. That's unheard of for most universities, let alone a younger institution like SIUE." Holten is CEO of Holten Meat, Inc., an industry-leading meat processor headquartered in Sauget, Ill. His father started the company in 1960 in East St. Louis. Holten began working there as a college student in 1961, and after graduating from SIUE in 1964, worked there full time. In 1988, using his marketing knowledge, Holten trademarked the phrase "Thick 'N Juicy" to distinguish his hamburger patties from the competition. In his 47 years at the company, Holten has helped Holten Meat grow to more than 300 employees and expand product distribution nationwide and into the Caribbean. Holten Meat remains a family-run business that includes Holten's brother, Mike (BS '77) (also an SIUE graduate), two sisters and his son and daughter. The only non-family member owner is Scott Hudspeth who serves as the chief operating officer. Today, the company is the largest certified Angus ground beef patty producer in the U.S. Its meat products are sold in grocery stores, restaurants and various baseball, football and hockey stadiums throughout North America. Holten Meat's hamburgers were even sold at this year's Super Bowl. Holten firmly believes that a business must provide its customers with not only products, but also solutions. "That can be challenging for some business owners, especially when the ideal solution for the customer doesn't necessarily benefit the business," he says. Much like ketchup and hamburgers go hand-in-hand, Holten frequently defines his business philosophy in the words of Heinz® Company founder Henry J. Heinz: "To do a common thing uncommonly well brings success." Considering Holten Meat's undisputed status as an industry leader, the company's name may one day be synonymous with hamburgers the way that Heinz® is with ketchup.